Natural smoky quartz from Arkansas is quite rare - most of the very dark points and clusters for sale have been sent out to be irradiated. This gem grade large Arkansas smoky quartz crystal with clustered and regrown base, however; NATURALLY occurred in Garland County. Splendid at 1-1/2x 2x 6", it's 2-1/4x 3-3/4x 6-1/4" overall. 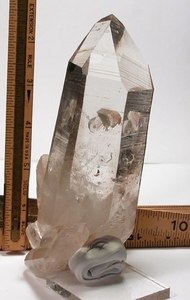 Large main channel-faced with an uncommon 7h prism face, there are speck-sized fleabites, record keepers, penetrator crystals [to 1x 2-1/2", two defaced], rainbows in the base veils. Iron and blue shale inclusions are in the base. Keep from sun and/or fluorescent display lighting to preserve the fine, rare natural tint.